We love the simple jobs, of course, but it’s the complex projects like this one that keep us on our toes. Archadeck of Austin was thrilled to be called in to design and build this Round Rock, TX, homeowner’s total backyard makeover. To sum it up, we extended the back porch, added a pergola and built an outdoor fire place. Sounds easy enough, right? Well … sometimes there’s more than meets the eye, as the saying goes. The family had a sweet porch at the back of the house, but they wanted a porch that was much larger and more open to the back yard. Basically they wanted to give their old porch new life by making it part of an extended outdoor living area. They were adding a swimming pool and hot tub, too. The new porch and pergola combination will not only invite people from the house to come out and enjoy the outdoors, it will also serve as the poolside lounge area. To start, we needed to demolish the two stone columns that supported the original porch roof. We weren’t moving or changing the roofline, but since we were extending the porch footprint, the columns would have ended up being in the center of the expanded porch area. They definitely had to go. We were able to transfer the weight of the porch roof by inserting a large (5”x16’) Glulam beam into the porch cover and all the way over to the house wall. That Glulam beam is a workhorse. To complete the transfer of roof weight from the stone columns to the large beam, we took down some of the stone on the corner of the house and rebuilt the point load for the beam to pocket into the wall. Then we reinstalled all the stone. You can’t even tell we were there — unless you remember the original stone columns and notice that nothing but usable space fills the area where they once stood. 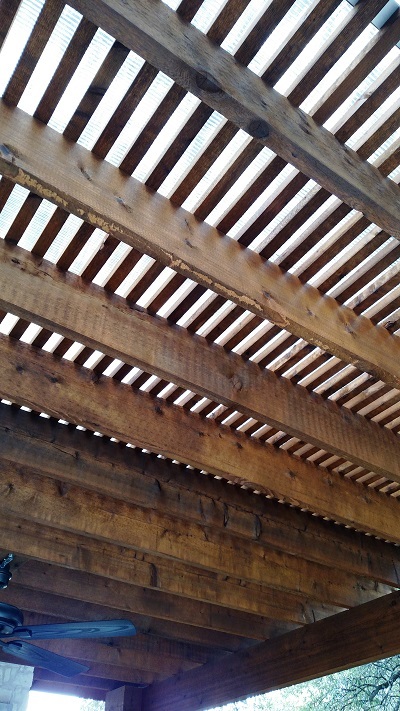 We replaced the original Hardieplank porch ceiling with natural tongue-and-groove cedar. The homeowner wanted to paint the ceiling white to help open and brighten space. The white ceiling does help lighten up the area, and it provides a nice contrast to the wooden posts and beams, which are all stained butternut brown. To make the porch roof’s support system look uniform, we also rebuilt the original beam on the projection side of the porch so it looks more like the large new beam on the front edge. Next, the job of extending the home’s outdoor living area entailed building a pergola over the area not covered by the porch roof. We added a Polygal cover on top of the pergola for shade and protection from rain. 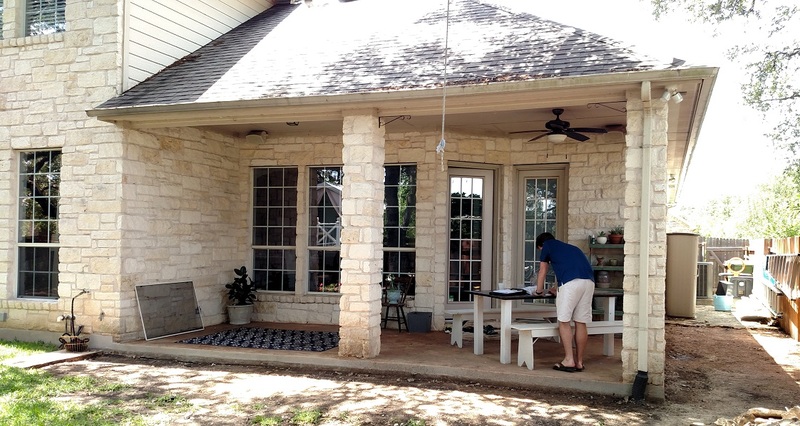 You can’t see the pergola cover in these photos, but it’s there. 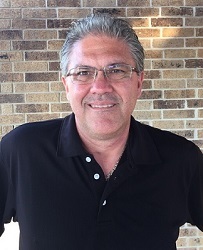 Keep in mind, if you are thinking of adding a pergola to your outdoor living space, it’s important to tell your builder what you want from the pergola — what its function will be. In some cases, a pergola is purely a decorative element that can help define a space and provide some shade. 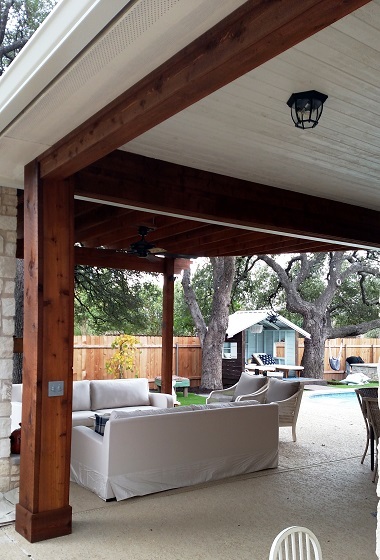 In the case of this Round Rock, TX, project, the homeowner wanted the pergola to provide protection from the elements. For this much protection, you do need to add a cover to the pergola. Not only does it protect from rain, the Polygal cover provides UV protection from the sun’s rays as well. This pergola was a little different because we built it with an angle on the end at the homeowner’s request. If we had extended the pergola all the way to the end of the porch/patio area, it would have required an additional post for support, which would have blocked their view of the pool. Accommodations like this are unusual but not at all difficult. Finally, we come to the outdoor fire feature — the fireplace. With a width of 7’ it is big enough to house a wide-screen TV over the mantle. We built the fireplace using limestone that matches that of the existing home. You’d think the home and outdoor fireplace were built at the same time! It’s a gas-burning fireplace, so we incorporated gas lines into the design. As a finishing touch, we are adding sconce lighting fixtures on the three posts at the end of the porch. If you look closely you can see a cap protecting the openings for electrical wiring on two of the posts. The lights are on back order. Cody Pools installed the pool and hot tub in conjunction with this same outdoor living project. We’re calling this a total backyard makeover because, with the porch greatly enlarged and the new pool taking up much of the remaining area, the whole back yard was pretty much transformed. 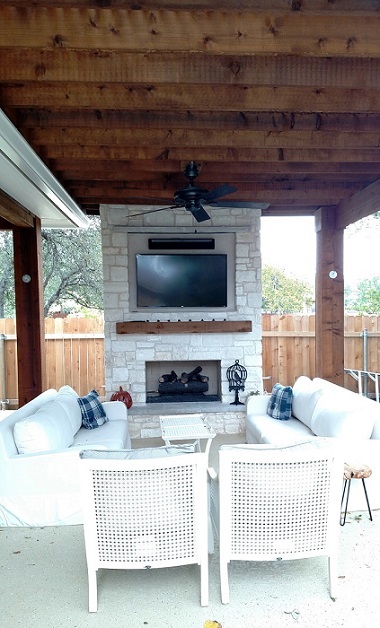 If you would like to learn more about designing a makeover for your porch, or your entire back yard, contact Archadeck of Austin today at (512) 259-8282 or via email at [email protected] to schedule a free design consultation.